Startupbootcamp is on the hunt for the hottest German startups in the Smart City & Living industry! Startupbootcamp aims to innovate the Smart City & Living ecosystem by providing the most promising startups in the world with a top-notch accelerator program based in Amsterdam. During the intense 3-month accelerator program, up to 10 selected startups will collaborate with 150+ mentors, partners and investors to build world class products, with the ultimate goal of becoming industry-leading sustainable companies. At the end of the program, startups will pitch their innovative ideas in front of hundreds of investors, partners and mentors at Demo Day. The Startupbootcamp Smart City & Living accelerator program will be in Munich on the 16th of January 2017 to meet and mentor the most ambitious Smart City & Living startups. During the Office Hours, you will be able to have an informal chat with Co-founder of Startupbootcamp and Smart City & Living Selector Edwin de Zeeuw. Together with Edwin, you will look on your idea, product and team, and he will be able to give you feedback and answer your most burning entrepreneurial questions. You will also have a chance to find out more about the SmartCity & Living accelerator program as well as network with fellow entrepreneurs. Are you a startup that is ready to re-invent the SmartCity & Living industry on top of existing solutions? Then we are looking for you! 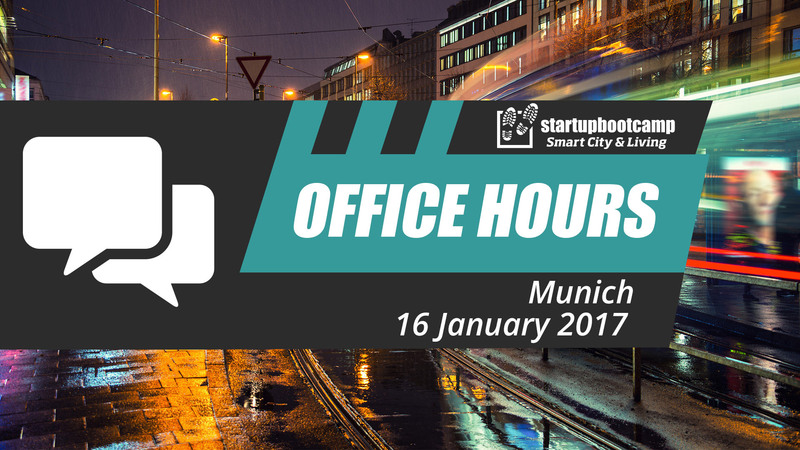 Join the Office Hours in Munich on 16 January 2017. Apply here and join the experience! If you have any questions about the Startupbootcamp Office Hours, feel free to drop us a line at bastiaan@startupbootcamp.org.